To study specific histone modifications within a chromatin context, Active Motif's Recombinant Histones with site and degree-specific modifications can be used as substrates for chromatin assembly. The Chromatin Assembly Kit includes native HeLa core histones and recombinant chaperone and assembly proteins for the in vitro assembly of nucleosomes in a natural, ordered array on either circular or linear input DNA. The kit also includes reagents to confirm the ordered array of nucleosomes on the DNA with a simple and quick partial enzymatic digestion. The partial digestion clearly shows the ordered spacing of nucleosomes on the DNA (Figure 1). Figure 1: Digestion of chromatin assembled from supercoiled circular and linear DNA. One hundred µl reactions were performed on 1 µg of either linear or circular DNA using the Chromatin Assembly Kit protocol. Following the chromatin assembly incubation, each reaction was divided in two, and partially digested with 0.5 µl Enzymatic Shearing Cocktail for 2 and 4 minutes, respectively. 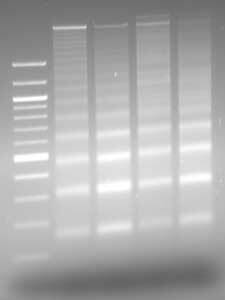 Samples were subsequently deproteinated with Proteinase K, phenol/chloroform extracted and analyzed by agarose gel electrophoresis. Lane 1: 100 bp DNA ladder. Lane 2: Circular DNA digested with Enzymatic Shearing Cocktail for 2 minutes. Lane 3: Circular DNA digested with Enzymatic Shearing Cocktail for 4 minutes. Lane 4: Linear DNA digested with Enzymatic Shearing Cocktail for 2 minutes. Lane 5: Linear DNA digested with Enzymatic Shearing Cocktail for 4 minutes.